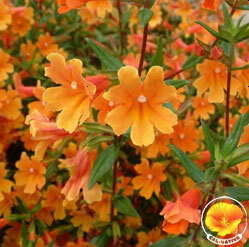 Mimulus 'Pumpkin' is one of the best performing and 'garden tolerant' of the dry Mimulus species/hybrids. Although it still requires well drained soil and drier conditions, in most environments it stays evergreen and can bloom through the year with supplemental summer water when other varieties will die. Reaches 18-24"H x 18-24"W and blooms profusely with two toned pumpkin orange flowers. Truly stunning and effective in the garden, especially in mass.